The values of innovation and entrepreneurship are alive and well at Exeter – with students and alumni pioneering tech solutions to environmental issues, innovating to improve support for the homeless and harnessing the power of Artificial Intelligence in music, to name but a few examples. 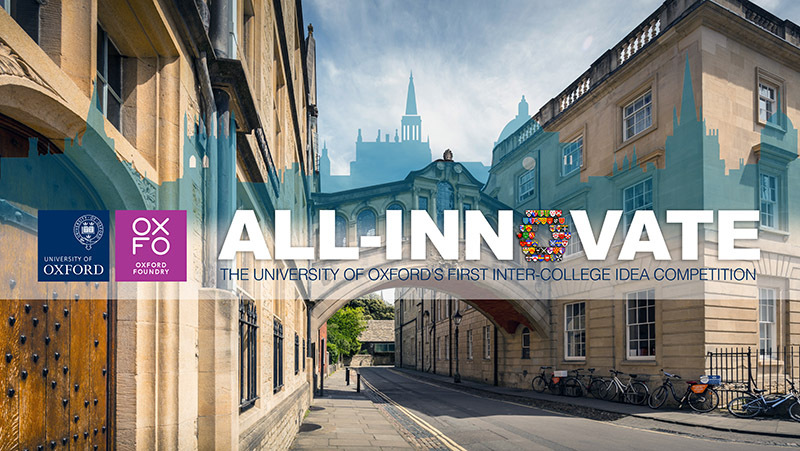 That is why Exeter is delighted to be taking part in Oxford’s inaugural All-Innovate idea competition, an exciting initiative led by the University’s new centre for entrepreneurship, the Oxford Foundry. This university-wide competition encourages students to pitch their entrepreneurial ideas for a chance to win a top prize of £10,000. Students from any and all disciplines are welcome to apply in College teams, and they will be supported through the process by Exeter and a group of alumni mentors with experience in successful entrepreneurship. We look forward to sharing some of our students’ innovative ideas with you in the new year! To read more about the competition, please click here.